DIE Jovis, videlicet, 5 die Maii. Making Saltpetre and Gunpowder to be considered. Answer to the King's Message about Sir Jo. Hotham's refusing Him Admittance into Hull. Instructions for the Committees going into Yorkshire. Message to the H. C. that the Lords agree with them in these. Petition from the County of Kent presented. This Petition and Answer to be printed. 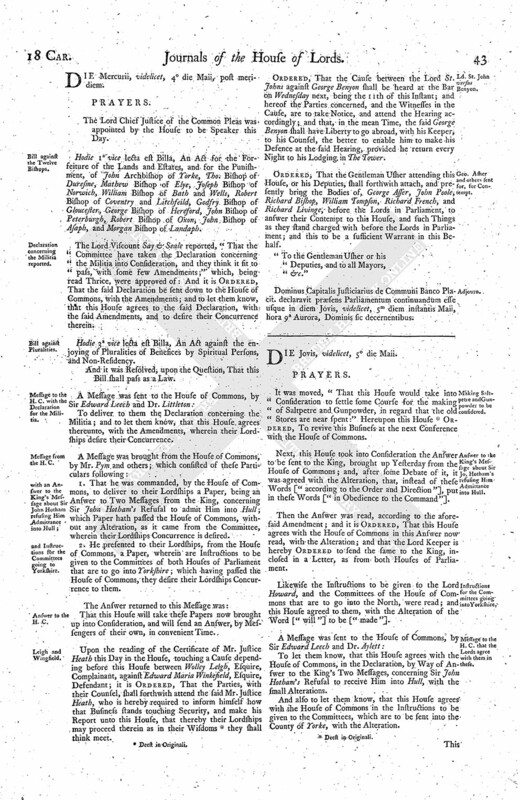 Petition of the Eleven other Bishops. The Bishops to be bailed. Bp. of Litchfeild and Coventry bailed. Motion for the sequestered Rents of Sutton Marsh to be lent for the Service of Ireland. Order for putting off Private Causes for a Time. For Colonel Beeling to be speedily tried in the King's Bench. Order for securing Money borrowed of the Merchants Adventurers for Ireland. For the Declaration about the Militia to be printed. The Answer to the King's Messages. And the Instructions for the Five Committees going to Yorkshire. Colonel Beeling to be proceeded against. Order to pay 20000l. to the Merchant Adventurers. To be printed and published. Answer from both Houses to the King's Messages about Sir John Hotham refusing Him Admittance into Hull. Instructions for the Committees going to Yorkshire. Bill for exempting Four Counties from the Marches of Wales. Bill for restraining Peers made hereafter from voting in Parliament. It was moved, "That this House would take into Consideration to settle some Course for the making of Saltpetre and Gunpowder, in regard that the old Stores are near spent:" Hereupon this House (fn. 1) Ordered, To revive this Business at the next Conference with the House of Commons. 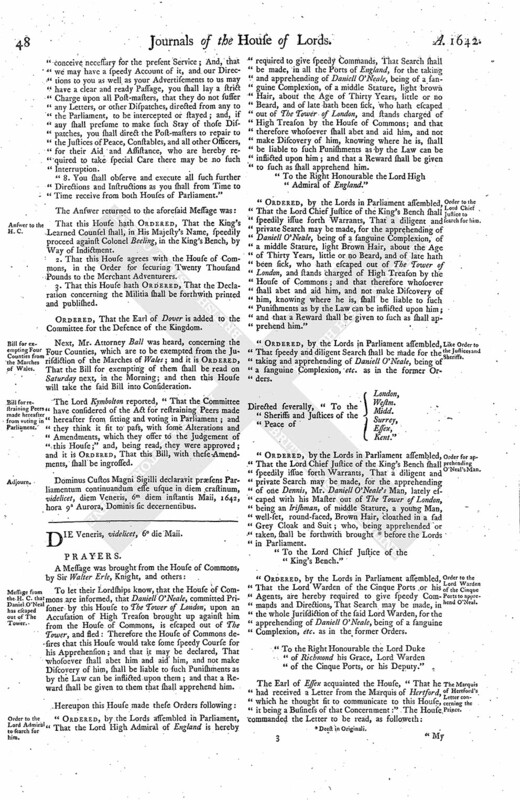 Next, this House took into Consideration the Answer to be sent to the King, brought up Yesterday from the House of Commons; and, after some Debate of it, it was agreed with the Alteration, that, instead of these Words ["according to the Order and Direction"], put in these Words ["in Obedience to the Command"]. Then the Answer was read, according to the aforesaid Amendment; and it is Ordered, That this House agrees with the House of Commons in this Answer now read, with the Alteration; and that the Lord Keeper is hereby Ordered to send the same to the King, inclosed in a Letter, as from both Houses of Parliament. Likewise the Instructions to be given to the Lord Howard, and the Committees of the House of Commons that are to go into the North, were read; and this House agreed to them, with the Alteration of the Word ["will"] to be ["made"]. To let them know, that this House agrees with the House of Commons, in the Declaration, by Way of Answer to the King's Two Messages, concerning Sir John Hotham's Refusal to receive Him into Hull, with the small Alterations. And also to let them know, that this House agrees with the House of Commons in the Instructions to be given to the Committees, which are to be sent into the County of Yorke, with the Alteration. This Day Mr. Blunt, being accompanied by many Knights and Gentlemen of the County of Kent, presented a Petition to this House, which Petition was agreed on upon the Vote at the last Sessions, and subscribed now with about Six Thousand Hands, which were gotten in Fourteen Days, and many Thousands more intend to subscribe it, but are not yet come to Town; but, when they come, it was desired that they might have Leave to subscribe their Names; and many that have been willing to subscribe it have been deterred by others ill affected. "To the Right Honourable the Peers now assembled in Parliament. 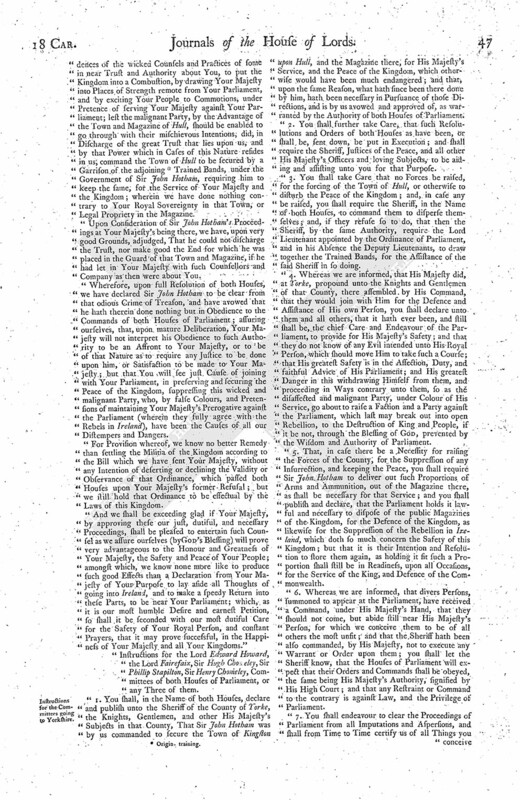 "That your Petitioners, or many of them, have hitherto exhibited to both Houses of Parliament a Petition, concurring with those of the Renowned City of London, and other several Counties of this Kingdom, expressing their Zeal to the true Religion and the pure Worship of God, and their loyal Affections to the King's most Excellent Majesty, and their hearty Love to the Parliament. 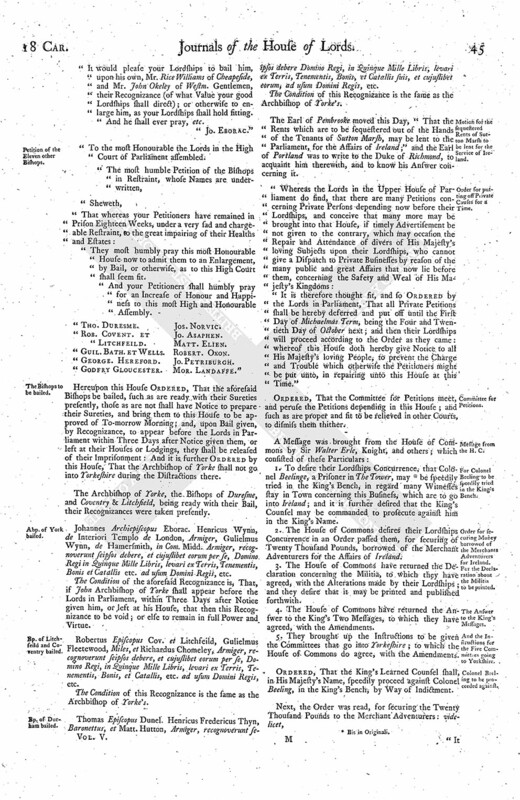 "That your Petitioners do, with all Humility, return their utmost Thanks unto this Honourable Assembly, for your favourable and gentle Acceptance of their Petition, your great Care, Vigilancy, and incessant Labours, for the Advancement of the true Reformed Religion, the Honour and Welfare of His Majesty and His Kingdoms, for the continued Endeavours for a right Understanding between His Majesty and the Parliament, for your constant Addresses to His Majesty to dissuade Him from His Personal Expedition into Ireland, and especially for that to us so welcome a Declaration of the Lords and Commons, April 9, 1642, concerning your pious Intentions for a necessary Reformation, which revives our Hopes, and will further your Reckoning in the Day of the Lord; and that your Petitioners do most heartily rejoice to behold the happy Union of both Houses of Parliament, and the mutual Concurrence of them and the whole Kingdom, wherein, under His Majesty, the Safety of the Three Kingdoms doth consist. "Yet your Petitioners cannot but plainly express with what sad Hearts they think on the many evil Occurrents, which interrupt your unparalleled Pains, and intercept the Fruit of your faithful Counsels from us, amongst which this is not the least; videlicet, a Petition, as we humbly conceive, of dangerous Consequence, contrived by some, and published the last Assizes holden for this County at Maidston; and then, yea yet, advanced for Subscribers, and intended to be exhibited to this Honourable House as the Petition of the whole Body of this County, to cause the whole Kingdom to believe that Petition to be the Act of the whole County of Kente, or the major Part thereof, whereby a great Scandal is brought upon this loyal and peaceable County; the same Petition being stiled The Kentish Petition, which we know is not the Act of the Body of the County, as it seems to speak, forasmuch as it was disavowed by many of the then Grand Jury, and Justices on the Bench, and since by all us your Petitioners, whose Names are underwritten. "Wherefore your Petitioners humble and earnest Prayer is, that your Honours would be pleased to accept this our Vindication of ourselves and County, who utterly disclaim the said Petition, humbly leaving it to the Wisdom, Justice, and Clemency of this Honourable Assembly, to [ (fn. 2) make a] Difference between the active Contrivers and Promoters, and unadvised Subscribers of it. 2. To list up your Hearts above all Discouragements in the Ways of the Lord, according to that your so Religious Resolution for Reformation in the Church, for a Consultation with Godly and Learned Divines, for the establishing of a Preaching Ministry throughout the whole Kingdom. "And your Petitioners, being sensible that to oppose or slight His Majesty's Parliament, and the Orders thereof, were to hazard the Safety of His Royal Person and all His Kingdoms, and to further the Designs of our Enemies, who hope, by causing our Division, to triumph in our Confusion, are unanimously resolved to maintain and defend, as far as lawfully we may, with our Lives, Powers, and Estates, His Majesty's Royal Person and Dignity, and also the Power and Privileges of Parliament, according to our Protestation. "And we shall ever pray, &c."
"I am commanded by my Lords to let you know, that they are very sensible, and receive much Content, in the good Affections which you have expressed to His Majesty, the Parliament, and the whole Kingdom, in this your Petition, wherein you have vindicated so considerable a County as Kente from that Imputation which some few malignant and ill-affected Persons, by their undutiful and seditious Practices, were likely to have cast upon the whole County, which is the more seasonable in regard of the Danger such evil Designs aimed at: The Parliament hath faithfully advised the Stay of His Majesty's Journey into Ireland, and humbly petitioned His Return to His Parliament; there shall be on their Part no Endeavours wanting for a happy Settlement of the Government both of Church and State." And his Lordship further told them, "That this House admits those Gentlemen to subscribe this Petition when they come to Town, as is desired; and that their Lordships will give Order, that this Petition and Answer shall be printed." Ordered, That this Petition of Kent, and the Answer thereunto, shall be forthwith printed and published. Next, was read the Petitions of the Twelve Bishops in The Tower of London. To the Right Honourable the Lords assembled in the House of Peers in Parliament. "It would please your Lordships to bail him, upon his own, Mr. Rice Williams of Cheapeside, and Mr. John Okeley of Westm. Gentlemen, their Recognizance (of what Value your good Lordships shall direct); or otherwise to enlarge him, as your Lordships shall hold sitting. "And he shall ever pray, etc. "To the most Honourable the Lords in the High Court of Parliament assembled. "They most humbly pray this most Honourable House now to admit them to an Enlargement, by Bail, or otherwise, as to this High Court shall seem fit. "And your Petitioners shall humbly pray for an Increase of Honour and Happiness to this most High and Honourable Assembly. Hereupon this House Ordered, That the aforesaid Bishops be bailed, such as are ready with their Sureties presently, those as are not shall have Notice to prepare their Sureties, and bring them to this House to be approved of To-morrow Morning; and, upon Bail given, by Recognizance, to appear before the Lords in Parliament within Three Days after Notice given them, or left at their Houses or Lodgings, they shall be released of their Imprisonment: And it is further Ordered by this House, That the Archbishop of Yorke shall not go into Yorkeshire during the Distractions there. The Archbishop of Yorke, the Bishops of Duresme, and Coventry & Litchfield, being ready with their Bail, their Recognizances were taken presently. Johannes Archiepiscopus Eborac. Henricus Wynn, de Interiori Templo de London, Armiger, Gulielmus Wynn, de Hamersmith, in Com. Midd. Armiger, recognoverunt seipsos debere, et cujuslibet eorum per se, Domino Regi in Quinque Mille Libris, levari ex Terris, Tenementis, Bonis et Catallis etc. ad usum Domini Regis, etc. The Condition of the aforesaid Recognizance is, That, if John Archbishop of Yorke shall appear before the Lords in Parliament, within Three Days after Notice given him, or left at his House, that then this Recognizance to be void; or else to remain in full Power and Virtue. Robertus Episcopus Cov. et Litchfeild, Gulielmus Fleetwood, Miles, et Richardus Chomeley, Armiger, recognoverunt seipsos debere, et cujuslibet eorum per se, Domino Regi, in Quinque Mille Libris, levari ex Terris, Tenementis, Bonis, et Catallis, etc. ad usum Domini Regis, etc. The Condition of this Recognizance is the same as the Archbishop of Yorke's. Thomas Episcopus Dunel. Henricus Fredericus Thyn, Baronettus, et Matt. Hutton, Armiger, recognoverunt seipsos debere Domino Regi, in Quinque Mille Libris, levari ex Terris, Tenementis, Bonis, et Catallis suis, et cujuslibet eorum, ad usum Domini Regis, etc. The Earl of Pembrooke moved this Day, "That the Rents which are to be sequestered out of the Hands of the Tenants of Sutton Marsh, may be lent to the Parliament, for the Affairs of Ireland;" and the Earl of Portland was to write to the Duke of Richmond, to acquaint him therewith, and to know his Answer concerning it. "It is therefore thought fit, and so Ordered by the Lords in Parliament, That all Private Petitions shall be hereby deferred and put off until the First Day of Michaelmas Term, being the Four and Twentieth Day of October next; and then their Lordships will proceed according to the Order as they came: whereof this House doth hereby give Notice to all His Majesty's loving People, to prevent the Charge and Trouble which otherwise the Petitioners might be put unto, in repairing unto this House at this Time." Ordered, That the Committee for Petitions meet, and peruse the Petitions depending in this House; and such as are proper and fit to be relieved in other Courts, to dismiss them thither. 1. To desire their Lordships Concurrence, that Colonel Beelinge, a Prisoner in The Tower, may (fn. 3) be speedily tried in the King's Bench, in regard many Witnesses stay in Town concerning this Business, which are to go into Ireland; and it is further desired that the King's Counsel may be commanded to prosecute against him in the King's Name. 2. The House of Commons desires their Lordships Concurrence in an Order passed them, for securing of Twenty Thousand Pounds, borrowed of the Merchant Adventurers for the Affairs of Ireland. 3. The House of Commons have returned the Declaration concerning the Militia, to which they have agreed, with the Alterations made by their Lordships; and they desire that it may be printed and published forthwith. 4. The House of Commons have returned the Answer to the King's Two Messages, to which they have agreed, with the Amendments. 5. They brought up the Instructions to be given the Committees that go into Yorkeshire; to which the House of Commons do agree, with the Amendments. Ordered, That the King's Learned Counsel shall, in His Majesty's Name, speedily proceed against Colonel Beeling, in the King's Bench, by Way of Indictment. "It is Ordered, by the Lords and Commons assembled in Parliament, That the Twenty Thousand Pounds now lent unto the Houses by the Fellowship of Merchants Adventurers of England shall be re-paid unto them, or their Assigns, together with Interest after Eight per Cent. for a Year, out of the Monies which shall be paid into the Chamber of the City of London, of the Receipt of Four Hundred Thousand Pounds lately granted by Way of Subsidy; and that this Ordinance shall be a sufficient Warrant unto the Commissioners of both Houses nominated and appointed in the said Act, to authorize the Lord Mayor of London, and the other Commissioners of the City, therein also named, to make due Payment of the said Principal and Interest, out of such Monies as shall come to their Hands of the said Subsidy of Four Hundred Thousand Pounds." Ordered, That this House agrees with the House of Commons in this Ordinance. 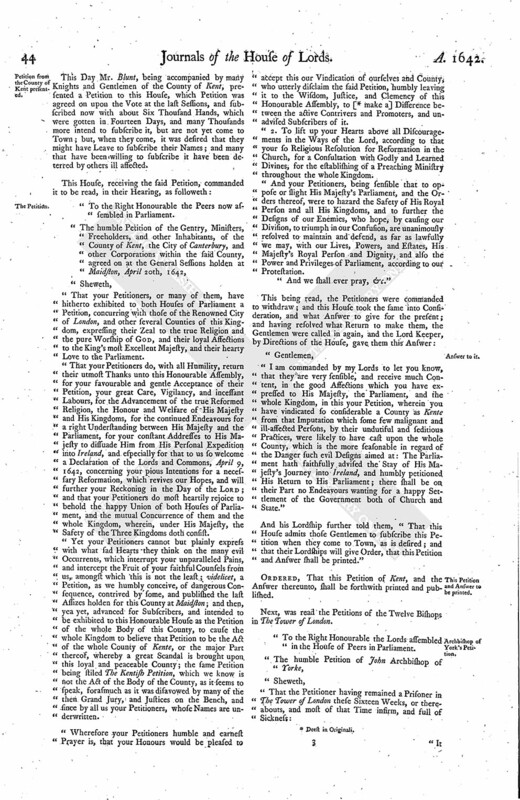 "The Lords and Commons, holding it necessary for the Peace and Safety of the Kingdom to settle the Militia thereof, did for that Purpose prepare an Ordinance of Parliament, and with all Humility did present the same to His Majesty, for His Royal Assent, who, notwithstanding the faithful Advice of His Parliament, and the several Reasons offered by them of the Necessity thereof, for the securing of His Majesty's Person, and the Peace and Safety of His People, did refuse to give His Consent; and thereupon they were necessitated, in Discharge of the Trust reposed in them as the Representative Body of the Kingdom, to make an Ordinance, by Authority of both Houses, to settle the Militia, warranted thereunto by the fundamental Laws of the Land: His Majesty, taking Notice thereof, did, by several Messages, invite them to settle it by Act of Parliament; affirming, in His Majesty's Messages sent in Answer to the Petition of both Houses presented to His Majesty at Yorke, March the 26th, that he always thought it necessary the same should be settled, and that He never denied the Thing, only denied the Way; and for the Matter of it, took Exception only to the Preface, as a Thing not standing with His Honour to consent to; and that Himself was excluded in the Execution, and for a Time unlimited. "Whereupon the Lords and Commons, being desirous to give His Majesty all Satisfaction that might be, even to the least Tittle of Form (fn. 4) or Circumstance; and, when His Majesty was pleased to offer them a Bill ready drawn, did, for no other Cause than to manifest their hearty Affection to comply with His Majesty's Desires, and obtain His Consent, entertain the same, and in the mean (fn. 4) Time no Way declining their Ordinance; and, to express their earnest Zeal to correspond with His Majesty's Desire (in all Things that might consist with the Peace and Safety of the Kingdom and the Trust reposed in them), did pass that Bill, and therein omitted the Preamble inserted before the Ordinance, limited the Time to less than Two Years, and confined the Authority of the Lieutenants to these Three Particulars, namely, Rebellion, Insurrection, and Foreign Invasion, and returned the same to His Majesty, for His Royal Assent: But all these Expressions of Affection and Loyalty, all these Desires and earnest Endeavours to comply with His Majesty, hath (to their great Grief and Sorrow) produced no better Effect than an absolute Denial, even of that His Majesty, by His former Messages, as we conceive, promised; the Advice of evil and wicked Counsels receiving still more Credit with Him than that of His Great Council of Parliament, in a Matter of so high Importance, that the Safety of His Kingdom and Peace of His People depends upon it. "But now what must be the Exceptions to this Bill? Not any sure that was to the Ordinance; for a Care was taken to give Satisfaction in all these Particulars! Then the Exception was, because that the Disposing and Execution thereof was referred to both Houses of Parliament, and His Majesty excluded; and now that, by the Bill, the Power and Execution is ascertained and reduced to Particulars, and the Law of the Realm made the Rule thereof, His Majesty will not trust the Persons. The Power is too great, too unlimited, to trust them with. But what is that Power? Is it any other, but in express Terms to suppress Rebellion, Insurrection, and Foreign Invasion? And who are those Persons? Are they not such as were nominated by the Great Council of the Kingdom, and assented to by His Majesty? And is it too great a Power to trust those Persons with the Suppression of Rebellion, Insurrection, and Foreign Invasion? Surely the most wicked of them that advised His Majesty to this Answer, cannot suggest but that it is necessary, for the Safety of His Majesty's Royal Person, and the Peace of the Kingdom, such a Power should be put in some Hands; and there is no Pretence of Exception to the Persons. His Majesty, for the Space of above Fifteen Years together, thought not a Power far exceeding this to be too great to intrust particular Persons with, to whose Will the Lives and Liberties of His People, by Martial Law, were made subject; for such was the Power given to Lords Lieutenants and Deputy Lieutenants in every County of this Kingdom, and that without the Consent of His Parliament, People, or Authority by Law; but now, in case of extreme Necessity, upon the Advice of both Houses of Parliament, for no longer Time than Two Years, a lesser Power, and that for the Safety of King and People, is thought too great to trust particular Persons with, though named by both Houses of Parliament, and approved of by His Majesty Himself; and surely, if there be a Necessity to settle the Militia (which His Majesty was pleased to confess), the Persons cannot be intrusted with less Power than this, to have it at all effectual: And the Precedents of former Ages, when there happened a Necessity to raise such a Power, never straightened that Power to a narrow Compass; witness the Commissions of Array in several Kings Reigns, and often issued out by the Consent and Authority of Parliament. "The Lords and Commons, therefore, intrusted with the Safety of the Kingdom, and Peace of the People (which they call God to Witness is their only Aim), finding themselves denied these so necessary and just Demands, and that they can never be discharged before God or Man, if they should suffer the Safety of the Kingdom and Peace of the People to be exposed to the Malice of the malignant Party at Home, or the Fury of Enemies from abroad, and knowing no other Way to encounter the imminent and approaching Danger but by putting the People into a fit Posture of Defence, do resolve to put their said Ordinance into present Execution; and do require all Persons in Authority by virtue of the said Ordinance forthwith to put the same in Execution, and all others to obey it, according to the fundamental Laws of the Kingdom, as they tender the Upholding of the true Protestant Religion, the Safety of His Majesty's Person, and His Royal Posterity, the Peace of the Kingdom, and the Being of this Commonwealth." Ordered, That this Declaration be printed and published forthwith. "The most humble Answer of the Lords and Commons in Parliament, to Two Messages from Your Sacred Majesty, concerning Sir John Hotham's Refusal to give Your Majesty Entrance into the Town of Hull. "Your Majesty may be pleased to understand, That we Your Great Council, finding manifold Evi dences of the wicked Counsels and Practices of some in near Trust and Authority about You, to put the Kingdom into a Combustion, by drawing Your Majesty into Places of Strength remote from Your Parliament, and by exciting Your People to Commotions, under Pretence of serving Your Majesty against Your Parliament; lest the malignant Party, by the Advantage of the Town and Magazine of Hull, should be enabled to go through with their mischievous Intentions, did, in Discharge of the great Trust that lies upon us, and by that Power which in Cases of this Nature resides in us, command the Town of Hull to be secured by a Garrison of the adjoining (fn. 5) Trained Bands, under the Government of Sir John Hotham, requiring him to keep the same, for the Service of Your Majesty and the Kingdom; wherein we have done nothing contrary to Your Royal Sovereignty in that Town, or Legal Propriety in the Magazine. "Upon Consideration of Sir John Hotham's Proceedings at Your Majesty's being there, we have, upon very good Grounds, adjudged, That he could not discharge the Trust, nor make good the End for which he was placed in the Guard of that Town and Magazine, if he had let in Your Majesty with such Counsellors and Company as then were about You. "Wherefore, upon full Resolution of both Houses, we have declared Sir John Hotham to be clear from that odious Crime of Treason, and have avowed that he hath therein done nothing but in Obedience to the Commands of both Houses of Parliament; assuring ourselves, that, upon mature Deliberation, Your Majesty will not interpret his Obedience to such Authority to be an Affront to Your Majesty, or to be of that Nature as to require any Justice to be done upon him, or Satisfaction to be made to Your Majesty; but that You will see just Cause of joining with Your Parliament, in preserving and securing the Peace of the Kingdom, suppressing this wicked and malignant Party, who, by false Colours, and Pretensions of maintaining Your Majesty's Prerogative against the Parliament (wherein they fully agree with the Rebels in Ireland), have been the Causes of all our Distempers and Dangers. "For Provision whereof, we know no better Remedy than settling the Militia of the Kingdom according to the Bill which we have sent Your Majesty, without any Intention of deserting or declining the Validity or Observance of that Ordinance, which passed both Houses upon Your Majesty's former Refusal; but we still hold that Ordinance to be effectual by the Laws of this Kingdom. "And we shall be exceeding glad if Your Majesty, by approving these our just, dutiful, and necessary Proceedings, shall be pleased to entertain such Counsel as we assure ourselves (by God's Blessing) will prove very advantageous to the Honour and Greatness of Your Majesty, the Safety and Peace of Your People; amongst which, we know none more like to produce such good Effects than a Declaration from Your Majesty of Your Purpose to lay aside all Thoughts of going into Ireland, and to make a speedy Return into these Parts, to be near Your Parliament; which, as it is our most humble Desire and earnest Petition, so shall it be seconded with our most dutiful Care for the Safety of Your Royal Person, and constant Prayers, that it may prove successful, in the Happiness of Your Majesty and all Your Kingdoms." "Instructions for the Lord Edward Howard, the Lord Fairefaix, Sir Hugh Chomeley, Sir Phillip Stapilton, Sir Henry Chomeley, Committees of both Houses of Parliament, or any Three of them. "1. You shall, in the Name of both Houses, declare and publish unto the Sheriff of the County of Yorke, the Knights, Gentlemen, and other His Majesty's Subjects in that County, That Sir John Hotham was by us commanded to secure the Town of Kingston upon Hull, and the Magazine there, for His Majesty's Service, and the Peace of the Kingdom, which otherwise would have been much endangered; and that, upon the same Reason, what hath since been there done by him, hath been necessary in Pursuance of those Directions, and is by us avowed and approved of, as warranted by the Authority of both Houses of Parliament. "2. You shall further take Care, that such Resolulutions and Orders of both Houses as have been, or shall be, sent down, be put in Execution; and shall require the Sheriff, Justices of the Peace, and all other His Majesty's Officers and loving Subjects, to be aiding and assisting unto you for that Purpose. "3. You shall take Care that no Forces be raised, for the forcing of the Town of Hull, or otherwise to disturb the Peace of the Kingdom; and, in case any be raised, you shall require the Sheriff, in the Name of both Houses, to command them to disperse themselves; and, if they refuse so to do, that then the Sheriff, by the same Authority, require the Lord Lieutenant appointed by the Ordinance of Parliament, and in his Absence the Deputy Lieutenants, to draw together the Trained Bands, for the Assistance of the said Sheriff in so doing. "4. Whereas we are informed, that His Majesty did, at Yorke, propound unto the Knights and Gentlemen of that County, there assembled by His Command, that they would join with Him for the Defence and Assistance of His own Person, you shall declare unto them and all others, that it hath ever been, and still shall be, the chief Care and Endeavour of the Parliament, to provide for His Majesty's Safety; and that they do not know of any Evil intended unto His Royal Person, which should move Him to take such a Course; that His greatest Safety is in the Affection, Duty, and faithful Advice of His Parliament; and His greatest Danger in this withdrawing Himself from them, and proceeding in Ways contrary unto them, so as the disaffected and malignant Party, under Colour of His Service, go about to raise a Faction and a Party against the Parliament, which last may break out into open Rebellion, to the Destruction of King and People, if it be not, through the Blessing of God, prevented by the Wisdom and Authority of Parliament. "5. That, in case there be a Necessity for raising the Forces of the County, for the Suppression of any Insurrection, and keeping the Peace, you shall require Sir John Hotham to deliver out such Proportions of Arms and Ammunition, out of the Magazine there, as shall be necessary for that Service; and you shall publish and declare, that the Parliament holds it lawful and necessary to dispose of the public Magazines of the Kingdom, for the Defence of the Kingdom, as likewise for the Suppression of the Rebellion in Ireland, which doth so much concern the Safety of this Kingdom; but that it is their Intention and Resolution to store them again, as holding it fit such a Proportion shall still be in Readiness, upon all Occasions, for the Service of the King, and Defence of the Commonwealth. "6. Whereas we are informed, that divers Persons, summoned to appear at the Parliament, have received a Command, under His Majesty's Hand, that they should not come, but abide still near His Majesty's Person, for which we conceive them to be of all others the most unfit; and that the Sheriff hath been also commanded, by His Majesty, not to execute any Warrant or Order upon them; you shall let the Sheriff know, that the Houses of Parliament will expect that their Orders and Commands shall be obeyed, the same being His Majesty's Authority, signified by His High Court; and that any Restraint or Command to the contrary is against Law, and the Privilege of Parliament. "7. You shall endeavour to clear the Proceedings of Parliament from all Imputations and Aspersions, and shall from Time to Time certify us of all Things you conceive necessary for the present Service; And, that we may have a speedy Account of it, and our Directions to you as well as your Advertisements to us may have a clear and ready Passage, you shall lay a strict Charge upon all Post-masters, that they do not suffer any Letters, or other Dispatches, directed from any to the Parliament, to be intercepted or stayed; and, if any shall presume to make such Stay of those Dispatches, you shall direct the Post-masters to repair to the Justices of Peace, Constables, and all other Officers, for their Aid and Assistance, who are hereby required to take special Care there may be no such Interruption. "8. You shall observe and execute all such further Directions and Instructions as you shall from Time to Time receive from both Houses of Parliament." That this House hath Ordered, That the King's Learned Counsel shall, in His Majesty's Name, speedily proceed against Colonel Beeling, in the King's Bench, by Way of Indictment. 2. That this House agrees with the House of Commons, in the Order for securing Twenty Thousand Pounds to the Merchant Adventurers. 3. That this House hath Ordered, That the Declaration concerning the Militia shall be forthwith printed and published. Ordered, That the Earl of Dover is added to the Committee for the Defence of the Kingdom. Next, Mr. Attorney Ball was heard, concerning the Four Counties, which are to be exempted from the Jurisdiction of the Marches of Wales; and it is Ordered, That the Bill for exempting of them shall be read on Saturday next, in the Morning; and then this House will take the said Bill into Consideration. 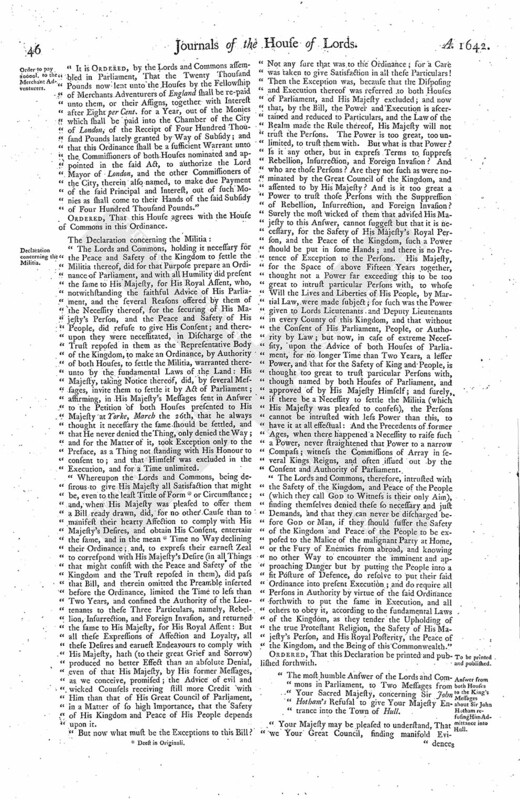 The Lord Kymbolton reported, "That the Committee have considered of the Act for restraining Peers made hereafter from sitting and voting in Parliament; and they think it fit to pass, with some Alterations and Amendments, which they offer to the Judgement of this House;" and, being read, they were approved; and it is Ordered, That this Bill, with these-Amendments, shall be ingrossed. Dominus Custos Magni Sigilli declaravit præsens Parliamentum continuandum esse usque in diem crastinum, videlicet, diem Veneris, 6m diem instantis Maii, 1642, hora 9a Aurora, Dominis sic decernentibus.